At least three people have died and more than 100 people have been injured after a train crashed into Hoboken Station, north New Jersey this morning. The incident occurred during the morning rush hour and has caused significant damage to the station. According to the BBC, some people are still reportedly trapped inside train carriages. Local bus and ferry services have been accepting train tickets in wake of the crash as rail services both into and out of the station have been stopped. Uber meanwhile has said that all rides taken from "Hoboken train station since the accident will also be refunded." Hoboken is a terminus and is the last stop for many commuters travelling from the west into New York City. The station is NJ Transit's fifth busiest and sees 15,000 boardings each weekday. “There are fatalities,” said an unidentified senior transportation official speaking in the New York Times. “There are a significant number of injuries. The train was going very fast. 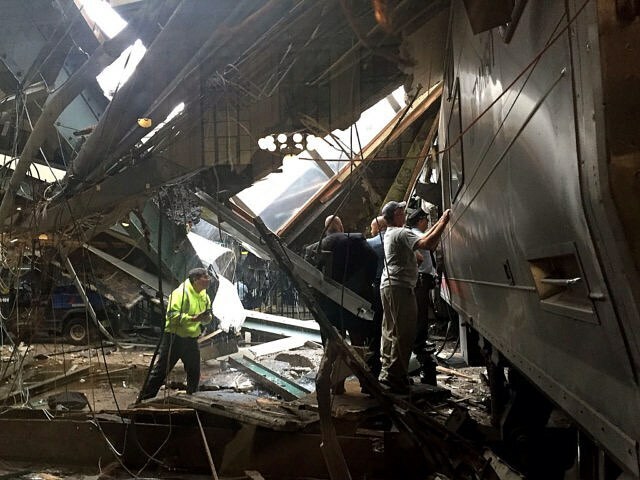 There are structural concerns about the facility.” Images and video footage of the aftermath depicts extensive damage to the train station, with a portion of the roof caved into the concourse. "I wasn't on the train, but I arrived just after it happened," eyewitness Ben Fairclough told the BBC. There was water coming down off the roof and people climbing out through the windows. There were people sitting down with blood coming from their head. There were lots of injuries." As to why the incident happened, there has so far been no response from the National Transportation Safety Board. When Madison Square Garden’s 50-year special permit expired last year, it launched a fiery debate over the future of the arena atop Penn Station. Critics, urban planners, and government officials have called for a 10-year term limit to encourage the relocation of MSG allowing for an overhaul of the crowded station. 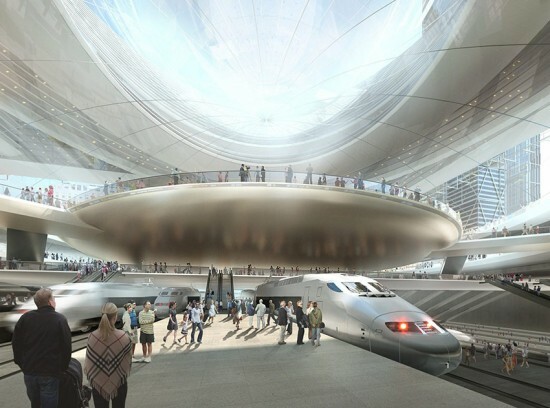 Today the Municipal Art Society of New York unveiled four different visions for a re-imagined Penn Station and MSG from firms Diller Scofidio + Renfro, H3 Hardy Collaboration Architecture, SHoP Architects, and Skidmore, Owings & Merrill (SOM). Each firm offered up its own rendition—some focused more on expanding infrastructure, while others honed in on opportunities for cultural and educational programming and new amenities within the station. But all the firms decided to relocate the arena, make room for green space, and create a new light-filled and spacious train terminal. And on the more far-reaching side, they envisioned and described this new station as a civic hub that will anchor and reinvigorate the surrounding neighborhood and serve as a “gateway” (a buzz word liberally used at the unveiling) for the city. The presentations were a fantastical exercise in design if all variables—funding, political might, and private interests—miraculously came together. H3 Hardy Collaboration Architecture was the first to take the stage. The firm recommends re-locating Madison Square Garden to a 16-acre site on the waterfront by the Javits Center, which would then pave the way for a new Penn Station to be built with an eight-track high-speed rail, a three-acre park, retail space, and a roof garden. The Farley Post Office would then be transformed into a Center for Education and the four corners of the station would be privately developed “hybrid buildings.” SOM has concentrated on providing a robust infrastructure with a network of high-speed rail lines for the North East Corridor, better commuter rail service, and rail lines linking to the major airports in the area. The station will have a ticketing hall in center of building and then two concourses below with retail spaces. The firm would move Madison Square Garden to an adjacent location and imagines private development will crop up around the station. Charles Renfro of Diller Scofidio + Renfro described their “Penn Station 3.0” as a “grand civic space founded on growth and innovation.” The transit node would become “both a front door and living room” that would be “alive 24/7” and organized by “fast, transit-oriented programs” and “slower” activities including retail, cultural space, and restaurants. MSG would then be moved to the west end of the Farley building. “In closing, we basically would put a wrecking ball to the site,” said Elizabeth Diller. SHoP Architecture’s Vishaan Chakrabarti started off talking about safety as a critical challenge to the current Penn Station aggravated by a “lack of air” and “disorientation” caused by MSG. The firm envisions an open, light-filled station that would be at the heart of a new district they’ve dubbed “Gotham Gateway.” They would relocate MSG to the Morgan site and create “a link from east to west and north to south” connecting the station, a new park, and the arena. While the other presenters focused on design, SHoP dipped its toe in public policy side of the equation. 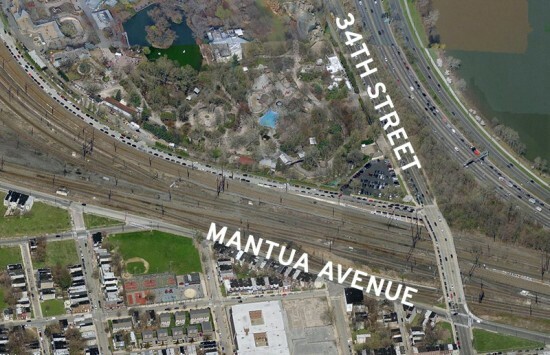 The firm is calling for the creation of a “Gateway Task Force” consisting of the Vice President, US Transportation Secretary, the governor, and the mayor, which would serve to facilitate a relocation of MSG, spearhead the Gateway Project (including funds for new tunnel, track and station), and provide necessary amenities.